Q: Vice Foreign Minister Kong Xuanyou is said to be visiting Pakistan now. Can you confirm and give us more details? A: At the invitation of the Pakistani side, Vice Foreign Minister Kong Xuanyou is now on a visit in Pakistan, exchanging views with the Pakistani side on the situation between India and Pakistan. Q: The United Nations Security Council will discuss next week a proposal from France and Britain to blacklist the head of the Pakistani extremist group that is blamed for the attack in Kashmir. Will China support this proposal or will it abstain? A: We have stated our position on this issue many times. It is a serious matter for the Security Council and its subsidiary body to take any action regarding the listing of terrorist organizations and individuals. China will take part in relevant deliberations in the Security Council and its subsidiary body in a responsible and conscientious way. Q: Today, ROK President Moon Jae-in said that in order to mitigate the impact of smog drifting over from China, the ROK has asked for the Chinese government's assistance, for example by setting up a ROK-China smog warning system. What is your comment? A: I haven't seen the report you mentioned. But I wonder if the ROK side has enough evidence to prove that their smog came from China. I have noted that media reports say that the PM 2.5 level in Seoul has reached 147 micrograms per cubic meter these days, perhaps higher than Beijing's level. Everyone is talking about the problem of smog in recent years. We've now realized that the causes are very complex. I believe we need to adopt a science-based attitude in considering how the smog is formed and how it can be effectively treated. It will be great if all countries can cooperate on this issue. As for the specific details of such cooperation, I would refer you to China's authority in charge of environment protection. Q: Pakistan's Ministry of Foreign Affairs released a statement on March 5 that Pakistan's High Commissioner to India will be returning to New Delhi soon. A Pakistani delegation will visit New Delhi on March 14, followed by the return visit of an Indian delegation to Islamabad on March 28, to discuss the Kartarpur Corridor along the Pakistan-India border. The statement also said that Pakistan will continue its contact with India at Military Operations Directorate level. What is your comment? China welcomes the above-mentioned progress as stated by Pakistan's Foreign Ministry which will help ease and improve the regional situation. We have said many times that Pakistan and India are permanent neighbors. Their harmonious co-existence serves the fundamental interests of the two sides and regional peace and stability. We hope that the two sides will continue to demonstrate goodwill, meet each other halfway, properly settle differences through dialogues, and improve bilateral relations. China will continue to play a constructive role in this regard. Q: Latest satellite images show that the DPRK is restoring part of a launch site it has pledged to dismantle earlier. Now this development comes after the Hanoi summit. What's your comment on this? A: Regarding the second US-DPRK summit in Hanoi, we noted that after their meeting, the US side and the DPRK side both expressed their willingness to continue with their dialogues. We believe that this is constructive, and the international community should encourage the two sides to make further efforts in such a direction. As for these details revealed by the press, we have noted them. In fact, the DPRK has taken positive measures towards denuclearization since last year, which deserves recognition and encouragement. Under the current circumstance, we hope that all relevant parties will stick to the right path of resolving the Korean Peninsula issue through political dialogues, strive to meet each other halfway, and make concerted efforts to promote denuclearization of the Korean Peninsula and peace and stability in this region. Q: There are reports saying that natural disasters have led to a poor harvest in North Korea and there has been a cut in food rations. Will China offer humanitarian assistance disregarding UN sanctions? A: As a permanent member of the UN Security Council, China has been strictly fulfilling its international obligations. There is no doubt about that. The DPRK has been experiencing difficulties that merit international humanitarian assistance. In fact, not just China, many countries believe that necessary assistance should be provided on the grounds of humanitarian reasons. Q: Portugal's Prime Minister Antonio Costa said in an interview with the Financial Times that EU countries should not misuse security procedures to discriminate against non-EU investment. He said that Portugal shared the concerns of other countries over potential risks rising from the involvement of Huawei in 5G networks, but it is very important not to stop the modernization of Europe's digital infrastructure. 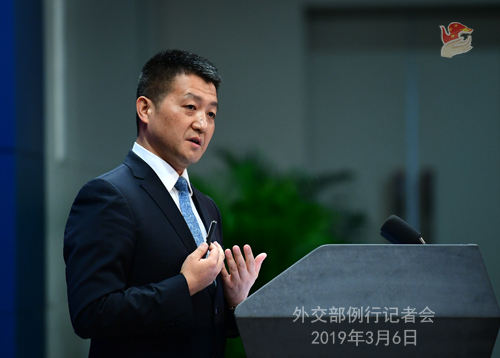 We also noted that on March 5, Huawei opened its Cyber Security Transparency Centre today in Brussels, and a Huawei senior official called on relevant industries and governments to establish unified, objective cyber security standards. What is your comment? A: We believe that Prime Minister Costa's remarks are objective and reasonable. 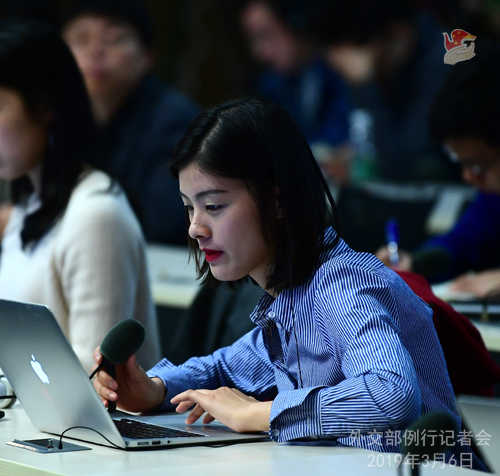 Recently, more and more people have demonstrated their just attitude towards the Chinese tech company's participation in the building of 5G networks. You may have noted from media reports that Huawei entered into cooperation agreements with companies from many countries during the Mobile World Congress which concluded last week. This shows that most countries make independent policy decisions on the basis of their own interests, and most companies around the world remain committed to safeguarding a fair and just market environment. As for the cyber security initiative proposed by Huawei, I want to say that cyber security is a global issue that bears on the common interests of all countries. The international community needs to make concerted efforts to uphold cyber security. China believes that the international community should work together to address cyber security threats through dialogue and cooperation on the basis of mutual respect, equality and mutual benefit. Frankly speaking, if left unchecked, practices to misuse security concerns to undermine market environment and obstruct international cooperation will ultimately deliver a heavier blow to economies that have more developed and advanced industries and scientific and technological level. We don't believe that it serves the interests of any economy. We maintain that it is a constructive proposal to establish unified, objective, open and transparent cyber security standards. Q: Canadian Foreign Minister Freeland expressed concern on the decision of China's General Administration of Customs to revoke a Canadian company's permit to export canola to China, and said that she does not "believe there's any scientific basis for this". Does China have any comment? A: I have seen relevant reports. I can assure you this is a sound decision by the Chinese government. We have learned that recently, China customs authorities detected hazardous organisms in imported Canadian canola repeatedly. The problem with one company is especially severe. China customs therefore decided to suspend import according to relevant Chinese laws and regulations as well as international customary practice. This is completely justifiable and legal. Canada, the world's largest producer of canola seeds and top exporter of canola seeds and canola, surely understands the severity of the threat intruding hazardous organisms pose to agricultural production and ecological security. Like all other countries, the Chinese government needs to ensure the health and safety of Chinese citizens. Q: Is it true that Italy and China will sign a Memorandum of Understanding on Italy participating in the Belt and Road proposal? A: As my colleagues and I said here many times, since the Belt and Road Initiative (BRI) was proposed six years ago, more and more countries and international organizations have shown strong willingness to participate. They have seen that it is indeed a good platform for mutually-beneficial and win-win cooperation. If there is any information concerning the BRI, we will release it in a timely manner. Q: You just announced that Vice Foreign Minister Kong Xuanyou is in Islamabad at present and holding talks with the Pakistani government. Can you please provide us a little insight into what the thrust of the talks are going to be? Secondly, will China be advising Pakistan to crack down on the terrorist groups further? Thirdly, recently in the China-Russia-India Foreign Ministers' meeting there was a resolution that the three countries will be working to eliminate the breeding ground of terrorism and extremism in the neighborhood, so will that particular message be carried out to Pakistan by the minister? A: First, Just now I announced that Vice Foreign Minister Kong Xuanyou is in Pakistan at the invitation of the Pakistani government. His mission is very clear, to communicate with the Pakistani side on the recent tensions between India and Pakistan. The latest developments in India-Pakistan relations are not what we would like to see. China is committed to safeguarding regional peace and stability and hopes to see its two good friends India and Pakistan on good neighborly terms. Second, I am sure you have noted the important statements Pakistan recently made on counter-terrorism, which, in fact, are in line with its long-term efforts to fight terrorism and contribute to the international counter-terrorism cause. The international community should accord Pakistan objective assessment and recognition. It is our hope that all sides could strive to build a favorable and enabling environment so that an international synergy will be formed in fighting terrorism. 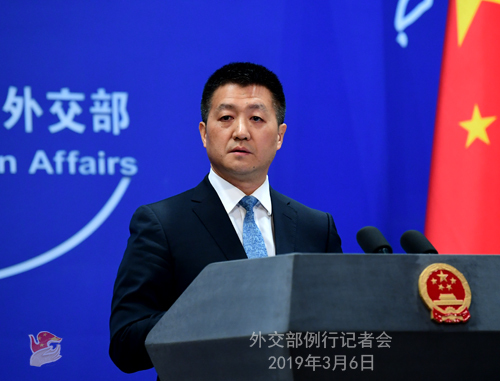 Third, as to your question concerning the "breeding ground of terrorism", a topic at the China-Russia-India foreign ministers' meeting, it has been an important and consistent view and belief of China that there are complicated factors underlying the birth of terrorism. And we believe that to eradicate terrorism, we need to treat both symptoms and root causes. Follow-up: Will he be visiting India too? A: As we have said, China is in close contact with both India and Pakistan on the current situation to facilitate reconciliation and dialogue. Q: About the UN 1267 Committee, the listing issue has come before this particular committee for several times. What China's role is going to be? Because the rest of the P5 countries except China have said that they would like to back what France, the UK and the US had moved. So all eyes are on China now. Considering that Mr. Masood's terrorist group Jaish-e-Mohammed has admitted in open about the particular act of terrorism in Kashmir, and that China is playing a big role in trying to bring down the tensions, can we expect a more positive action from China this time at the 1267 committee? A: I will add on my response to an earlier question raised by the Reuters that, the Security Council and its subsidiary bodies have explicit standards and rules on working procedures. China is participating in consultations in strict compliance with these standards and rules. You are surely aware that multilateral discussions of these issues call for a serious and responsible attitude. China's attitude shows its strong sense of responsibility and is conducive to the real and lasting resolution of relevant issues. Q: All eyes are on the BRI, Italy and China. The US is skeptical about the possibility that Italy's endorsement of the BRI could help the Italian economy, and asks its partners and allies to press China on international rules and standards on investment. What is your comment on that? A: Can you be more specific? Is it about the remarks of a US White House official on the possibility that Italy might join the BRI? Journalist: Yes, from an official from the White House cited by the Financial Times. A: I have also seen the report and frankly speaking, I find the remarks quite ridiculous. For one thing, Italy, a developed economy, knows very well where its interests lie and is fully capable of making its own policy decisions. For another, to the relevant person in the US who claims that joining the BRI will be detrimental to Italy's national image, I would like to point out that on one hand, over 150 countries and international organizations are actively participating in BRI cooperation and sharing opportunities for common development. On the other hand, a certain country kept saying joining the BRI will bring no good. I leave it to you to imagine what a lonely figure that certain country cuts on the international stage. Q: Yesterday Libyan Prime Minister Fayez al-Sarraj declared that he agreed with the head of the Libyan National Army, Khalifa Haftar, to organize presidential and parliamentary elections by the end of this year. Does China have any comment about Libya? A: I believe you know China's position on Libya. Just last month, during his meeting with Prime Minister Fayez al-Sarraj in Munich, member of the Political Bureau and director of the Office of the Foreign Affairs Commission of the CPC Central Committee Yang Jiechi reaffirmed China's desire to see steady progress in Libya's reconciliation and domestic reconstruction. 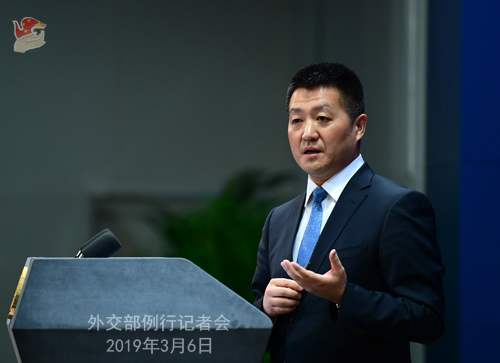 On the basis of the three-step approach proposed by the Special Representative of the UN Secretary-General, China supports the international community in playing a constructive role. We hope the situation in Libya can return to stable as soon as possible, thus creating a favorable environment for an early reconstruction. Q: Australia's trade minister says the processing times are still longer than average for coal exports to China. Is this a deliberate move toward Australia? If so, what has the country done to provoke this response? A: I have released relevant information before. The relevant Chinese authorities carry out normal border inspection according to laws and regulations. I don't think it makes any sense to see this as a deliberate move taken by the Chinese side. Q: South Korean media have reported that the Chinese leader may visit the DPRK in mid-March. Can China confirm this? A: We have answered similar questions many times. China and the DPRK share a tradition of exchange of high-level visits. Maybe you need to ask the ROK media how it got this information in the first place. Q: Just a follow-up related to the Belt and Road Initiative. I just want to ask if you can confirm that there are discussions between Italy and China? A: As I said earlier, since the Belt and Road Initiative was first put forward six years ago, more and more countries and international organizations have expressed their interest and a growing number of countries have signed Belt and Road cooperation agreements with China. 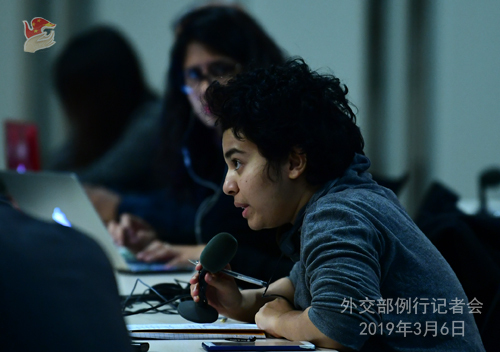 During China's normal, friendly exchange and dialogues with other countries, we talk about the possibility and prospect of relevant countries and international organizations if they join the BRI. I think there is nothing strange for China to talk about this with friendly countries. As for whether China and Italy will conclude an agreement, we will be glad to tell you once we have solid information. Q: Canadian Prime Minister Justin Trudeau has expressed concerns after Chinese authorities announced that they suspect Michael Kovrig and Michael Spavor of spying and stealing state secrets. Do you have any information about what's the next step in terms of their case? Will they be charged? Do we have a deadline when that would be and what the specific charges might be? Any further information? A: As I said earlier, the relevant authorities in China released detailed information on Michael Kovrig's case where he is suspected to have engaged in spying and stealing state secrets. The information is very clear, that Kovrig is suspected of activities endangering China's national security. To be more specific, since 2017, he has been engaging in many activities where he spied on and stole China's national secrets and intelligence in serious violation of China's national security. As I said, the relevant Chinese authorities are dealing with this case in a law-based manner. As for your question on what the next-step will be, as an executive authority, we cannot prejudge a judicial process.